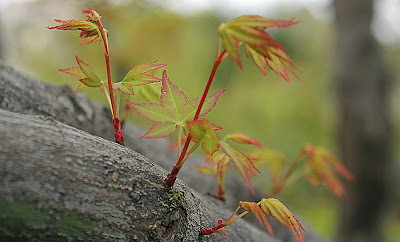 ﻿Japanese maple (Acer palmatum) is valued for its beautiful leaves and desirable form as a tree. Different varieties come in different colors, shape of leaves and growth habit. In early spring, the leaves and flowers come out at the same time. Depending on weather conditions, the canopy cover grows so fast that the flowers go unnoticed until the samaras increase in size to be noticeable. Although the wind was still gusty after the storm, I went out in between rain showers. 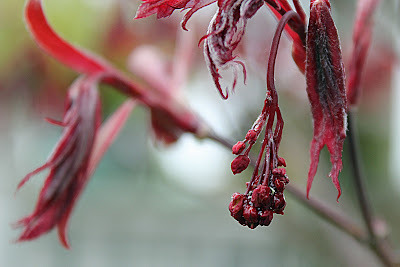 I thought that I'd take pictures of the Japanese maple trees in my backyard with special emphasis on the developing flowers. Fig. 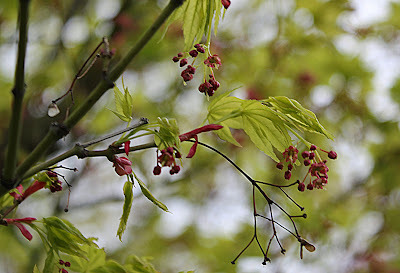 2 Clusters of small flowers mimic the color of the new branches and leaves. Fig. 3 Current year's branches coming out of older trunks. Fig. 4 Red flowers are borne on the ends of the previous year's branches. Fig. 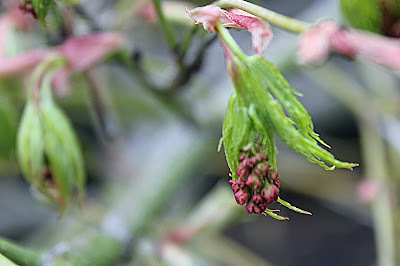 5 Acer palmatum dissectum 'Viridis' with drooping branches. Fig. 6 Propped-up branch for a peek of the flower buds. Fig. 7 The four-year old Japanese maple do not have flowers as of this year. Branches arising from old woody trunks do not flower on the first year (Fig. 3). 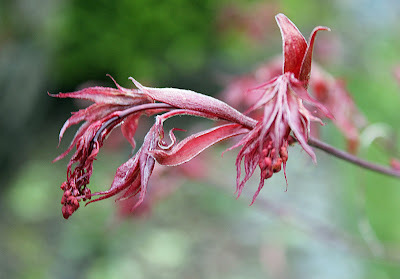 Japanese maple grown from seeds takes several years (at least more than 4 years) before they flower (Fig. 7). Plants growth is defined by nature's parameters - our role as gardeners is to figure them out. Fig. 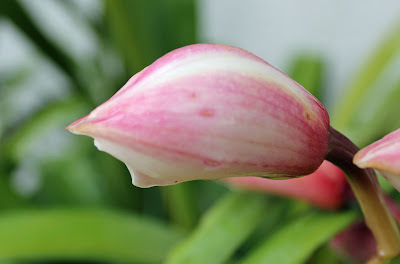 1 Cymbidium flower bud (March 25, 2010). 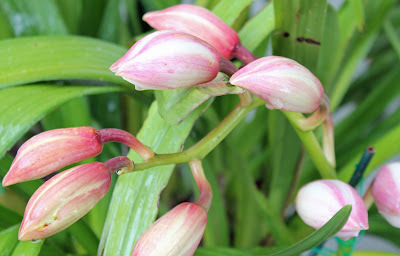 The opening of the cymbidium flower is a slow process especially during this season when the night time temperatures are still close to freezing. The good thing about his is that the flowers can be enjoyed at different stages. Petals are beginning to break the tight enclosure of the three sepals (Fig. 1). The sepals make up the outer whorl of an orchid flower. Fig. 2 The sepals beginning to reveal the petals. Inside the tight protection of the sepals are the petals. 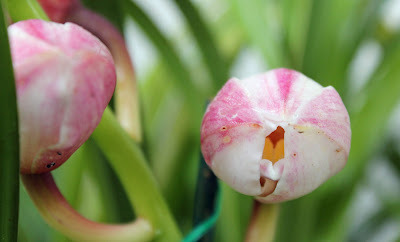 Cymbidiums have three petals. Two of them are identical and similar to the sepals in structure. The third of the three petals is different is shape, texture, and coloration. It is called the lip or labellum. I've always wondered why it called so but actually it looks like a lip that has been smeared with lipstick. This characteristic of the labellum is not obvious in these pictures but it can be observed from my previous posts. The yellow tissue that is seen through the small opening (Fig. 2) is called the tongue. Fig. 3 Unharmed by the storm we just had. The opening of the flowers is a concert of events leading towards one goal - pollination. Each event happens only at the appointed time. The opening of the petals has to coincide with the production of the right chemicals that produce the smell and the color that attract the right pollinators. When conditions force the flower to move forward out of schedule, it will fail to accomplish its task. Slowly but surely, the flowers are working to do their jobs. Hydrangea mycrophylla in early spring. Is there a relationship between your singing and plant growth? When we praise owners of beautiful plants they would gladly whisper to us as if it is a precious secret, "I sing to them every day." Well, the Royal Philharmonic Orchestra of London is supposed to been helping bring this myth to a scientific level by performing live to plants [*]. Do I believe that music make plants grow better? No. The plant that is sitting in the family room where music is played all day is no better than the one that is in the bathroom where no music is played except for an intermittent humming by my husband. Do I believe that a gardener singing in the garden would help the plants grow better? Maybe. Let me explain. When a gardener is singing in his garden he is close to the plants. He observes the things that are going on and he can respond to such observations accordingly. On the other hand, when a gardener is singing in the garden and is focused on his music book for the right note, then that singing does not have any effect on plant growth. In other words, it is the action-initiating proximity, and not the reverberating sound waves, that make the difference. That is my practical explanation of the matter. Fig. 2 Moss growing on rocks. ﻿ ﻿ A decade later (Fig.2) the hedge wall continues to grow. It requires a minimal maintenance which includes trimming twice a year and soaker-hose watering once a week during the hot summer months. Every other year, Redwood compost is applied over a thin layer of steer manure around the base of the plants. This process helps increase soil organic matter and earthworm population. The fertility and water-holding capacity of the soil is improved - both important in our area with hot and dry summers. Fig. 3 The combination of the wall and the hedges provides strong lines in the landscape. ﻿ Our yard started out as a rocky piece of land (approximately forty percent rocks). Every plant that we planted in this yard (except in the vegetable garden) required a crowbar. Sometimes we just dig out a single piece of rock and there is a hole enough to hold a five gallon plant. The rocks used on this wall (Fig. 2 and 3) are serpertine , similar to the rocks that are found in our property and the rest of the area. In fact, some rocks that were mined from our yard during the landscaping process became part of the rock wall. Fig. 4 'Down Under' in the fall of 2010. ﻿The rock wall and the boxwood hedge are structures in the garden that provide a sense of permanence. When the season brings the rest of the garden into dormancy, they remain green (Fig. 4) providing the garden the needed interest. The Natural History and Environment of El Dorado Hills. Permanent structures in a garden are like the eyes, lips and nose on a face. Design them carefully for timeless beauty in the garden. Plants are not breathing organisms. * But why do some of us treat them as if they are hamsters or cats? We just can't throw plants away even if we don't need them anymore. So we put them in a new but less conducive shelter in hope of future adoption. Well, these plants (Fig.1) are like those. They are no longer good for that corner in the garden but I still want to keep them. They have been uprooted and planted in small containers. The recovery will be slow but one day they will be lush once more and who knows, someone might be interested to have them. Fig. 2 Saved Schlumbergera stem now blooming. There are plants everywhere in my garden that are not supposed to be there. Spider plants, Christmas cacti (Fig. 2), and mints are growing in small pots here and there. Why I keep them is still a question. Could it be that my subconscious belief tells me that these plants are breathing - that to get rid of them could be murderous? I refuse to admit that I am in fact a hoarder of plants. Save your plants only if you know that they will be useful to you or someone else in this lifetime. Last August I planted a second crop of bok choy. From this crop, some were left unharvested to continue growing. The summer-crop bolted at 30 days after sowing. For this crop (Fig.1) however, it took four months before flowering began. Cyclamen in my patio remained green and blooming throughout the year. The problem encountered at this time is crowding. There are too many leaves in one small space (pot). To divide or to to plant them in a larger pot is the question. I am open to suggestions. ﻿﻿Chives are among the first herbs to come out in my garden. They are always green until they bloom when they will be crowned with lavender heads. I used to have my chives in the ground but those lovely seed heads scatter seeds freely and generously - and chives were growing everywhere. Now they are in pots of different sizes and slowly but surely I dug up all the volunteer-chives in the garden. The ones in the picture (Fig. 3) were started last fall from dividing an old plant. Clematis 'Ville de Lyon' line up one side of my yard to complement the roses along that side. During this time of the year, they are just beginning to lengthen the first and second internodes on the vines. Late in the spring, the roses and clematis will be mingling as good friends. ﻿﻿﻿ ﻿﻿﻿﻿﻿﻿﻿﻿ Some years ago I planted one, just one, blue violet into a pot. The next year there were several young blue violets around the pot. Then they were all over the vegetable garden. I like the plant because it is one of the early flowers that bloom in the area during late winter but now the plant is a weed. I have been removing every single plant that I can find. This plant (Fig. 7) is a survivor. Fig. 8 Ornamental Pear tree (Pyrus calleryana 'Bradford') blossoms. Fig. 9 Purple-leaf flowering plum tree (Prunus cerasifera) blossoms. These flowers (Fig. 9) remind me of the 'Sakura' or the cherry blossom, a well celebrated flower in Japan. They are beautiful as they bring life and color at the end of the dormant season. However, they are short-lived. They last for just a couple of days and then they are blown away by the wind. While they last, one must take the time to enjoy them. They also remind us that life moves on so that new blossoms will come again. Japan is hit by an earthquake, tsunami and, heaven forbid, by a nuclear meltdown. Thousands of lives are lost...but hope is not lost. By God's grace, new beginnings will come to every survivor. Sometimes plants remind us of our own mortality and sometimes they remind us of our hope for a new beginning. Fig. 1 Valencia Oranges in the winter. While other plants are starting a new season of production, most citrus plants are at the end of a season. When the garden looks bare and unproductive, the citrus plants remind us that their deciduous counterparts are just taking a break. They give us a glimpse of summer in a time when the frigid temperatures seem to freeze all possibilites in the garden. Fig. 2 First harvest: Good eating quality, mildly tart, and medium-sized. I have two 'Valencia' orange trees that are growing in large pots. Currently, they are laden with ripe and juicy fruits. Two weeks ago we harvested some of the fruits in preparation for the supposedly cold snow storm. We did not have the snow but at least the fruits (Fig. 2) got into the kitchen where they are now a regular part of our daily meals. Soon I will have to harvest them all so that the plant can start another season to produce. In my garden I also have a prolific 'Ponderosa' lemon tree where we harvest bags and bags of fruits every winter. This year I also received a small 'Meyer' lemon tree in a five gallon pot as a present from my mother-in-law. Fig. 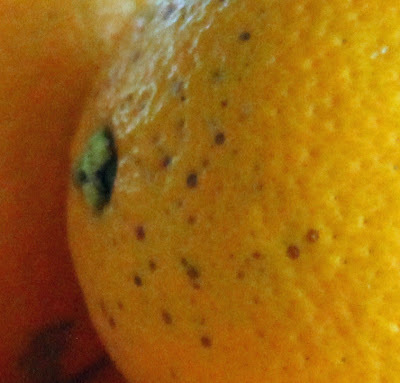 3 Scale insects on orange fruits. Last summer these trees were infested with scale insects. Since the trees are of manageable sizes, I decided to mechanically remove the insects off the branches, patiently. However, it was battle between me and the ants. As I demolished colonies of scale insects, the ants literally relocated the "pioneer" scale insects into new territories. No insecticide was applied. Some of the branches were severely damaged that I cut them off during the growing season. The ones that I missed are seen as leafless branches on Fig. 1. I hoped to win the battle against my wingless enemies (scale insects) the humane or organic way but I lost! I saw them on the fruits (Fig. 3). Those black dots on the rind are scale insects. Somehow, I fear that even after harvesting all of the fruits, some ants somewhere will protecting another "pioneer" to settle on the next spring leaves. Fig. 4 Limited growing space require regular pruning of plant. The tree will need to be replenished with all the lost nutrients soon. Fertilization is more important in potted plants than their in-ground counterparts since there is a limited hunting area for the roots. Pruning will also be necessary to remove as much of the damaged branches as possible. Since the trees also serve as ornamental plants, they will have to be trimmed and cut back to maintain a shape and size that is suitable for the limited space on that side of the yard (Fig. 4). "A man ought to carry himself in the world as an orange tree would if it could walk up and down in the garden, swinging perfume from every little censer it holds up to the air." My husband bought me a bunch of beautiful striped red roses last week. The florist at Costco (according to him) was so delighted to inform him that the rose is called 'Red Intuition' and that the other stores do not have them. With that my curiosity was awakened. This is what I found out about the rose 'Red Intuition'. The registered or official variety name is 'Delstriro' . 'Delstriro' is supposed to have resulted from a mutation of the 'Delego' rose variety  as discovered by Guy Delbard in 1999. What a beautiful mutant! 'Red Intuition' is a trademark (marketing name) owned by Delbard, a French company that specializes in breeding work on roses and fruit trees. Fig. 2 Perferctly arranged flowers on long stems. 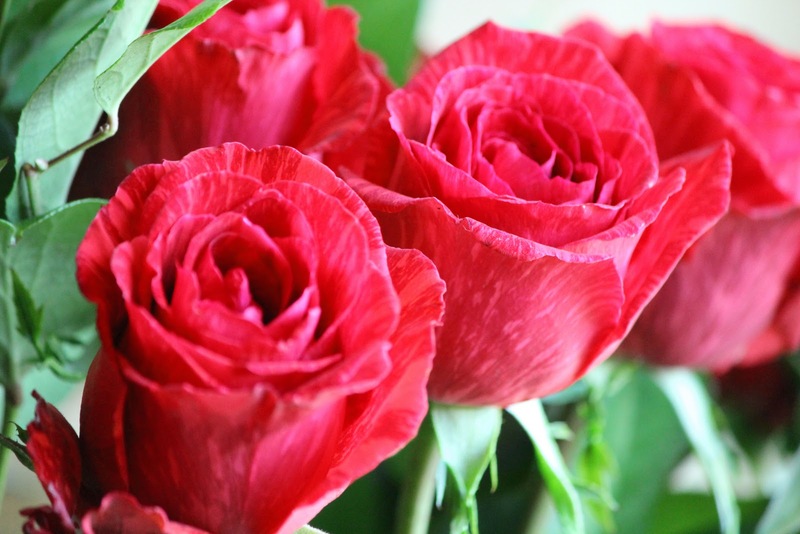 The flowers are beautiful with perfect: double cardinal red petals that are gracefully arranged on long stems. The feature that makes the flowers distinctly unique is the dark-red-on-red striped petals (Fig. 2) and their large head size. This particular variety is well known for its superb performance under greenhouse cultivation. It also responds positively to 'forcing'. Forcing is the process by which a plant is manipulated to bloom out of season. This means that 'Delstriro' can be forced to bloom to coincide with the time when red roses are in great demand as in Valentine's Day. This is a dream variety for flower growers and florists. 'Red Intuition' was named the "International Cut Flower of the Year 2000" . It was my personal observation that the flowers remained beautiful and upright for more than a week, probably ten days or so. That is a very long shelf life knowing that they probably came all the way from Colombia or Ecuador and spent some days in a refrigerated room somewhere before my husband purchased them. There you have it. 'Delstriro', a rose that mutated from its original traits as 'Delego'  into a different but desirable rose. With its trade name 'Red Intuition', Delstriro (along with 'Pink Intuition' a.k.a Delstripink) has become the choice flower among Hollywood consumers . 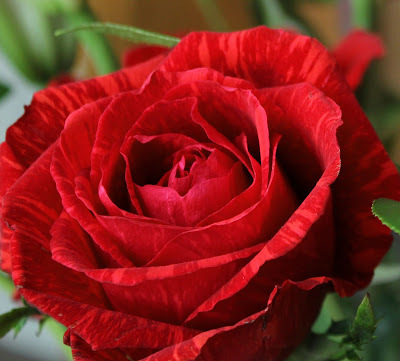 'Red Intuition' is 'Delstriro' rose. Regeneration is the natural process by which some plants or plant-parts replace and restore separated parts to resume a complete plant again. When this phenomenon is applied for the purpose of multiplying the number of plants without the use of seeds, the process is called cloning or vegetative propagation. The resulting new plant is called a clone. A clone is a regenerated plant (Fig. 1). A plant part - such as root, stem, or leaf, can be manipulated into forming new plants by severing it from the mother-plant. Most gardeners must have seen or grown an African Violet as a houseplant. African violet is a good example of a plant that can be cloned easily. To own one plant means that you have a mother-plant that can give you many new plants. Fig. 2 Leaves harvested from a mother-plant. The following pictures demonstrate some of the events that happen during the process of regeneration. Callus Formation. Plant parts such as leaves, when forcibly detached from the mother plant, undergo stress. The natural response for such plant parts (just like in other life forms) is to start healing. The first step in the healing process is the formation of soft protective tissue, known as callus, to cover the cut or wound. Callus is characterized by a thickened outer tissue which is brought about by the rapid formation of undifferentiated mass of cells. In Fig. 3, the brown colored end of the petioles is the callus. Fig. 4 The roots are identified from the callus by shape, direction of growth and color. Root Differentiation. The initial purpose of the callus is to form a protective surface over the wound to prevent further damage to the leaf. As long as the conditions are favorable, cells continue to grow even after the wound has healed. The leaf that was once a part of a plant will now start its own. Cells begin to respond to chemical, hormonal, and physical factors which trigger differentiation. Differentiation is the process wherein new cells take on new and identifiable form and role. When the wound that triggered callus formation is completely healed new events begin to happen. Instead of continuing to grow and clump with the callus, new cells begin to be different. Fig. 3 and Fig. 4 show roots forming from the callus. The first sign of new life from the leaf has begun. However, an old leaf with roots does not make a plant. Something still has to happen. Fig. 5 Shoot differentiation above the roots. Shoot differentiation. Cells continue to multiply as shown by the increased root mass (Fig. 5). The leaf (that was detached from a mother-plant) advances further to regenerate into a complete functioning plant. The wound and the area around it is now the center of various physiological activities. 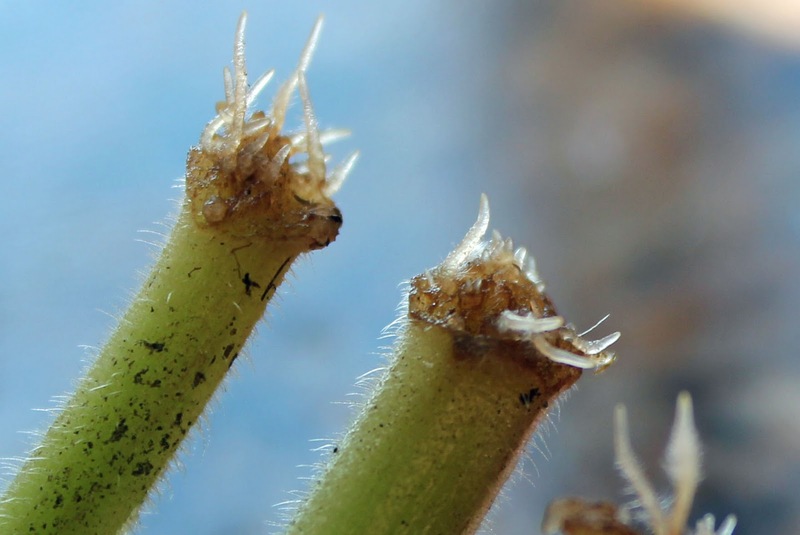 Not only have cells differentiated into roots but some begin to differentiate into shoot around the girth of the petiole just above the roots (Fig.5). 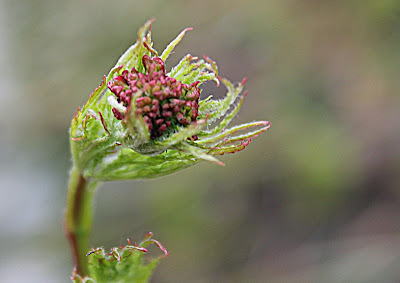 The shoots which are the part of the plant that will eventually bear the leaves and flowers have emerged. Fig. 6. Trichome-covered shoots emerging around the girth of the petiole. Note that differentiated tissues immediately assume the appearance of the organ. 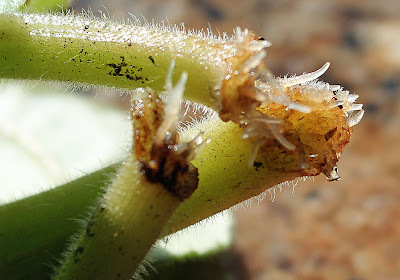 The shoot buds contrast with the roots by the following characteristics: presence of trichomes; green coloring which indicates the presence of chlorophyll; the form; and location and direction of growth (Fig. 6). Cells that differentiate into roots tend to grow towards the ground and those that differentiate into shoots grow upwards. Differentiation can be paralleled to the sorting of citizens into their political inclinations - some will be Republicans while others will be Democrats. Regardless of the direction and position of growth, all plant parts play a key role in the overall functioning of the plant. Fig. 7 Root hairs growing from the initial roots. 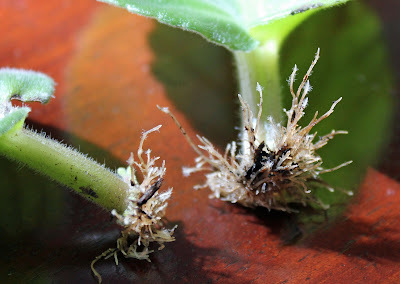 Steps in Cloning African Violets through Leaf Cuttings1. Take leaves from the outer ring of the foliage. Make sure to include part the petiole. 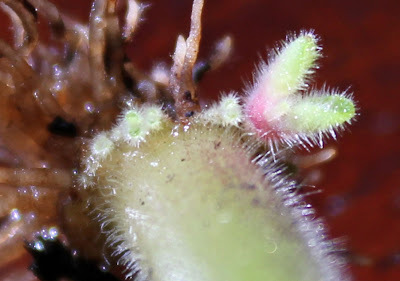 Leaf blades can be used - new plants grow from the midrib, however, the petiole, when cut diagonally, provides a greater surface are for more shoots to grow. 2. Fill up a pots with sand, perlite or potting soil. Potting soil and recycled plastic containers can also be used as seen in Fig. 2. Water until just moist and not soggy. 3. Lay the leaves with the cut surface touching the media (Fig. 2). Cover the pot to prevent fast water loss. 5. Wait and observe till plants develop and ready to be transplanted. Plants are super-organisms. 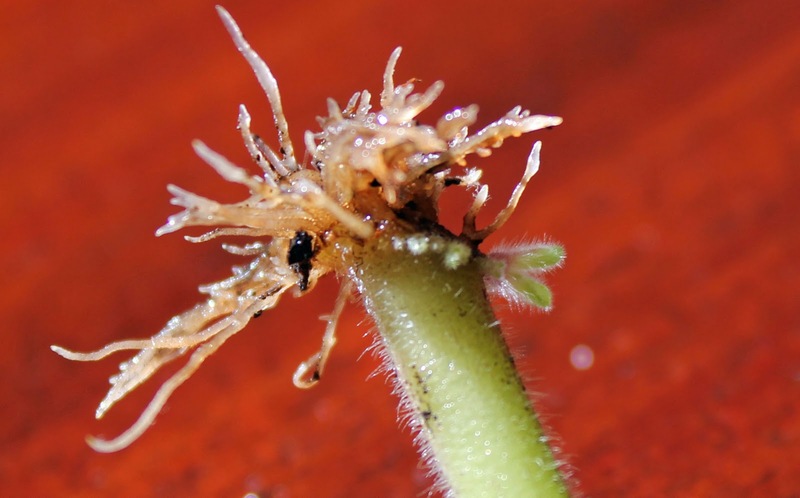 Given the right environment most plant tissues can regenerate into new plants.